The Third Grade program at Dade Christian School challenges students to reach their full potential as they develop their skills in the intellectual, spiritual, physical, and social realms in a fun and loving educational environment. Our curriculum is a thoroughly integrated, academically balanced program with a consistent Christian emphasis. Bible, Language Arts, Phonics, Reading, Math, Science, History, Spelling, and Penmanship all represent the subject areas. An emphasis is also placed on social interaction among the students, giving them opportunities to develop social values; respect, sharing, group acceptance, independence, and dependability. Each unit student’s encounter consists of a reading-writing connection, composition, and language skills. In the reading-writing connection students will view a model of the composition to be studied. During the composition focus students will concentrate on the writing process (prewriting, drafting, responding and revising, proofreading, and publishing). The language focus gives students instruction in the parts of speech, word usage, mechanics, and vocabulary development.  Dade Christian School’s goal is that each student not only develop clear and effective oral and written communication skills, but also gain confidence in his/her abilities. The reading objectives in third grade include comprehension, critical thinking skills, identifying story elements, context clue usage, vocabulary acquisition, and decoding skills. These reading elements will be strengthened by guided and independent reading in class readers, children’s literature, and content area books. Dade Christian School wants students not only to master reading, but also encourages students to independently pursue it. To achieve the goals of challenging and expanding student’s vocabulary and spelling development, students are taught strategies that target specific spelling patterns. The spelling words are successfully integrated throughout the subject areas which extend the meaning.